The last squire of Kings Weston was Philip Napier Miles. He lived there with his wife Sybil and was a gifted musician and composer. Although he died childless he made a major contribution to the local community. He had a wide circle of friends from a musical background and many came to stay with them at the house. It came as something of a surprise to all concerned that in 1864 the 54 year old Philip Skinner Miles’ wife Pamela fell pregnant. There were great celebrations at Kings Weston on the birth of an heir, Philip Napier Miles, in January 1865. Festivities at Kings Weston House were held on “a princely scale”. Family and 100 of the estate tenants were invited to a celebratory Ball. The front hall was decorated with exotic plants, ferns, foliage, orchids, flowers, orange and lemon trees in fruit from the estate glasshouses, and the whole house lit up with 200 lamps and candelabra. Mrs Miles welcomed guests and Philip William Skinner Miles presented his heir as visitors arrived. Philip Napier Miles was born into a privileged life at Kings Weston. He regularly joined his parents to theatrical performances and concerts and soon began to show an interest and aptitude for music. The long library at Kings Weston became the frequent venue for music recitals, and before long became better known as the music room. Napier Miles studied music in Dresden, and on his return to England, studied further under Hubert Parry. He was a recognised composer gaining modest recognition for his output which included several operas. Westward Ho! 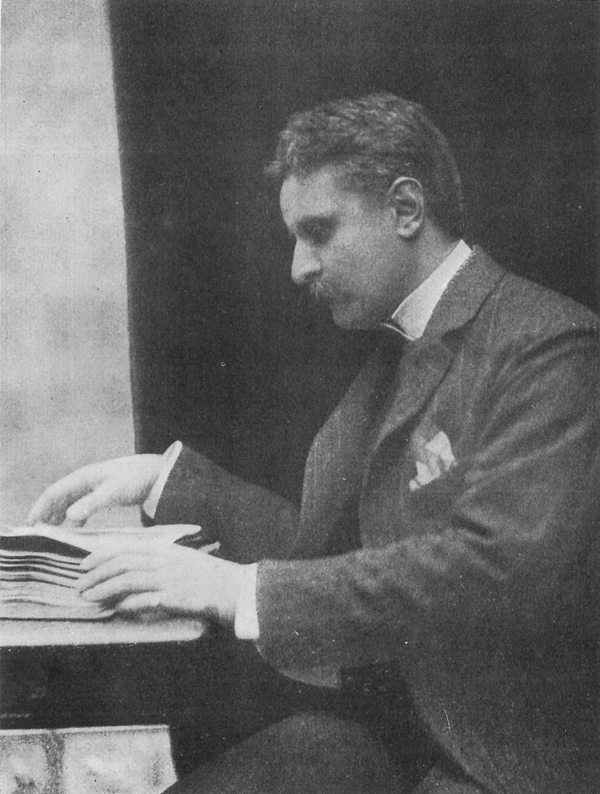 of 1913 Was performed at the Lyceum in London to positive reviews, and another opera, Markheim, received a Carnegie award in 1921. He often used his talents for charitable purposes, for example in 1890 the Bristol Mercury reported on one of two concerts held in aid of the fund for building Avonmouth church: “Mr P Napier Miles JP gave a concert of instrumental music on Tuesday evening in the beautiful Library at Kingsweston house to which he invited a very large number of the residents of Shirehampton and Henbury, nearly 400 persons being present. The Westbury Brass Band played a selection outside the house before the concert and during the interval”. Napier Miles had many friends with similar musical interests and amongst these he could count some of the most famous composers, conductors and musicians of the day. 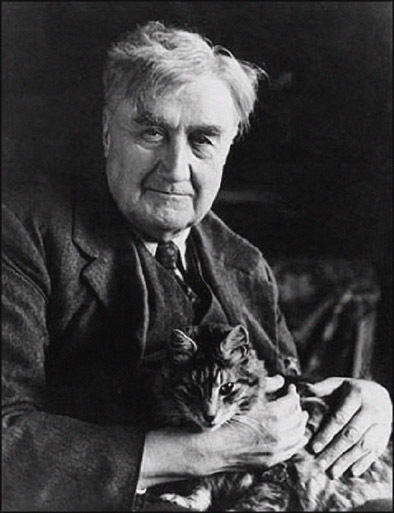 His friend Ralph Vaughan Williams, the composer, became a regular visitor to Kings Weston and it was on one such visit he completed, perhaps his most famous piece, “The Lark Ascending”. It was arranged specially to showcase the skill of Napier Miles’ musical protégé, Marie Hall, who was to perform in one of Napier Miles’s regular local concerts. It received its world premier at Shirehampton public Hall in 1920. While it received little attention at the time is today regularly voted Britain’s favourite piece of classical music. Vaughan Williams also published a melody in 1927 that he named after Kings Weston. The Kings Weston Estate office on Shirehampton High Street (demolished). Designed by Frederick Bligh Bond in 1906. Philip Napier Miles was a great philanthropist and the villages of Shirehampton and Avonmouth benefited greatly from his generosity. In 1902 he donated land and £100 for the construction of a new Public Hall and Library on Station Road in Shirehampton which would also become a regular venue for his concerts. It is perhaps not by coincidence that the architect Frederick Bligh Bond was appointed to the project as Napier Miles was keen on his work and had employed him elsewhere on his estate. 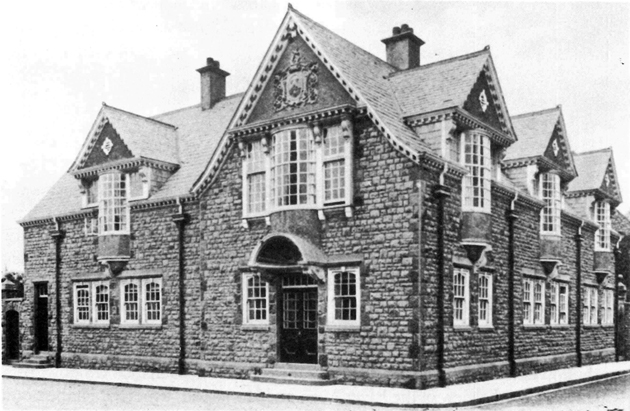 Bligh Bond had provided the new gate lodge at Kings Weston house in 1901, and other works followed including The Wylands on Shirehampton High Street, many houses on Station Road, and, probably his best work, the new Kings Weston Estate Office. This was built in the centre of Shirehampton. The erection of new purpose-built offices reflects the change in the estate from being reliant on agricultural tenants to the residents of newly-built urban estates that Napier Miles was encouraging. The town of Avonmouth was expanded at this time with much of the new development marketed as “Kingsweston Estate”. Frederick Bligh Bond later lost interest in architecture when he began the archaeological excavation of Glastonbury Abbey, but Philip Napier Miles again went to him for a project he had in mind for a new National Opera House. This too was to be sited in Glastonbury and was intended to be the English answer to Germany’s Bayreuth. Although Bligh Bond prepared some designs the project never developed further. Philip had married Sybil Marguerite Gonne in 1899. After the outbreak of the First World War the couple offered the use of Kings Weston House as a military hospital and rather than hand it over to the authorities they resolved to run it themselves. Sybil reorganised the house and took on management of the Auxiliary Hospital, opening it in 1915. She received the OBE after the war for her services. Until 1919 injured servicemen arrived at the house to recuperate from their injuries sustained on the front lines in Europe and the Music Room was turned over to use at the main ward. Many other parts of the house we also converted to temporary wards and the grounds were a relaxing environment for the recovering soldiers. 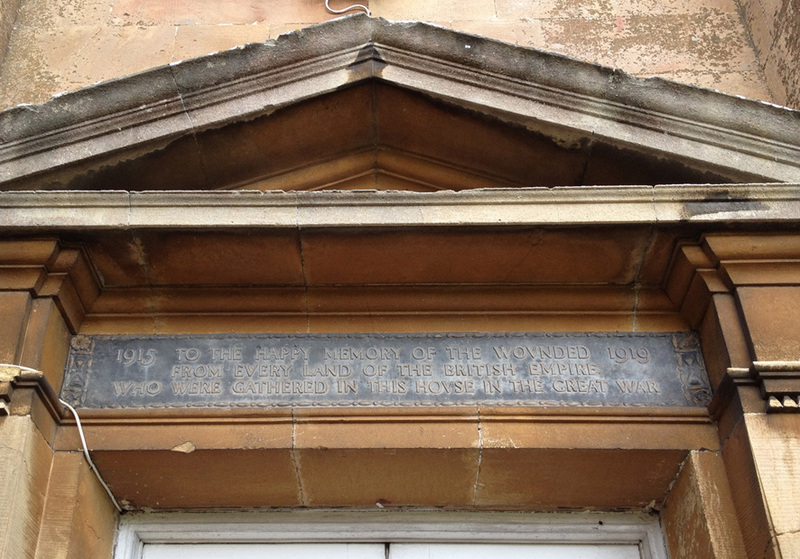 The memorial plaque above the entrance of Kings Weston House that commemorates the memory of the soldiers who attended the hospital there in the First World War. Bristol was at the forefront of the national housing scheme, Sea Mills Garden Suburb being one of the earliest of the post-war garden suburb layouts. A total of 1279 houses were built, the first ready by 1920 and the development completed in 1931. The First World War had also highlighted how poorly connected the city was to the modern dock facilities at Avonmouth. The principle route for vehicles and foot traffic had been through Shirehampton and Kings Weston park and it had proved extremely inconvenient. 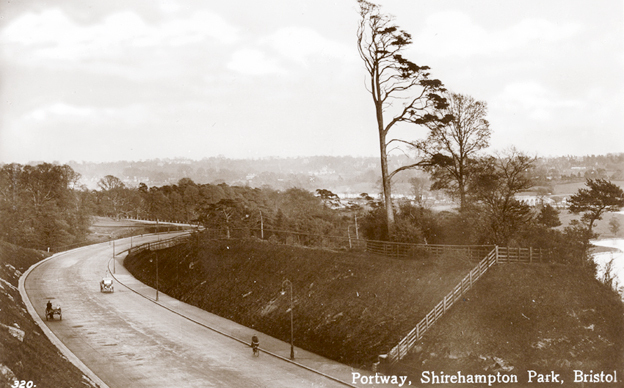 The City resolved to improve access by building a new road, the Portway, along the banks of the Avon. This required large tracts of Shirehampton Park to be compulsorily purchased from Napier Miles and a vast new cutting was gouged through the landscape. Work began in 1919 and when it eventually opened in 1926 it was the most expensive road project ever undertaken. It also came at incalculable cost to Kings Weston. 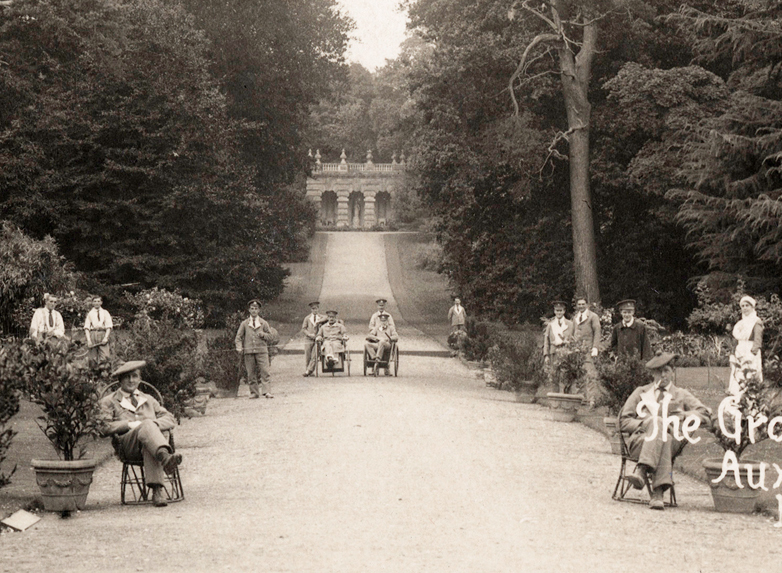 In an effort to protect the park from further damage and development Philip Napier Miles donated the Shirehampton Park part of the estate to the National Trust. This was finally transferred to their protection in 1923. Miles ensured that there were covenants on the donation which ensured that the land could be enjoyed in perpetuity for the recreation of the residents of Shirehampton and Sea Mills. He also required the use of the land for golf, and cricket to be protected. A keen golfer himself Napier Miles had been supportive of Shirehampton Golf Course when it was founded in 1904. He had leased the majority of Shirehampton Park to the new club. I am helping to create an exhibition “World War One and Local Memory”, to be shown in St Mary’s Parish church, Henbury, which will commemorate the part played by the people of Henbury Parish, its villages and hamlets, in the Great War. As the War Diary of the then Vicar, Charles Way, makes frequent reference to the work being done at King’s Weston, would it be possible to use the photo showing “Injured Servicemen Recuperating at King’s Weston Auxiliary Hospital” in the exhibition. Would be glad to get in touch with you again. Regret that I have mislaid previous communication (computer blips! ), but am still keen to use the photo mentioned above for our exhibition starting on 24th August. Also, I have quite a lot of quotes for you from the Henbury Parish Magazine of the World War One era. Would be glad if you could re-establish contact (am away from tomorrow for one week). Hi Jan, have sent another email to you. Let us know if you received it and we can sort out about the images.